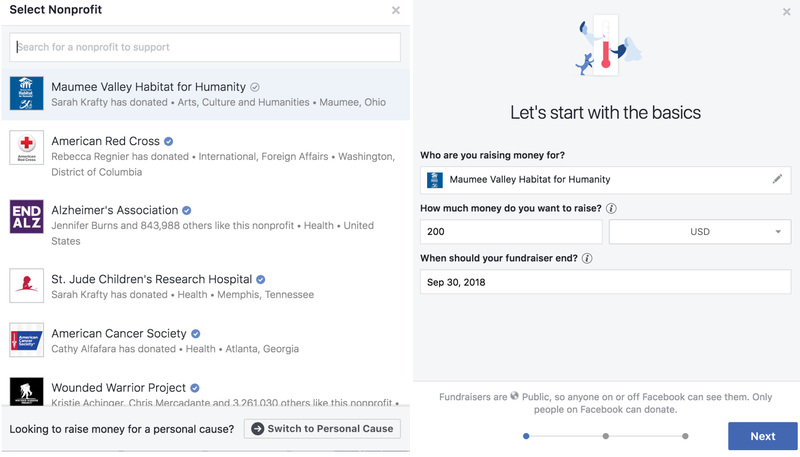 Creating a Facebook Fundraiser is a fantastic way to have your friends, family, and social networks support a nonprofit you believe in-anytime, anywhere. 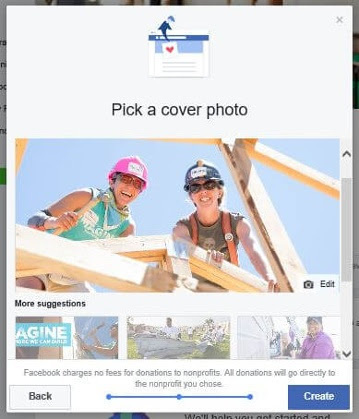 Thanks to Facebook waiving all donation fees, your donations go directly toward helping a nonprofit like Habitat, move toward fulfilling their mission. Step 1: Explore Fundraisers from your desktop/laptop or mobile device. On your home feed, scroll your mouse all the way to the left toolbar. Underneath the category Explore, click on the "Fundraiser" tab. 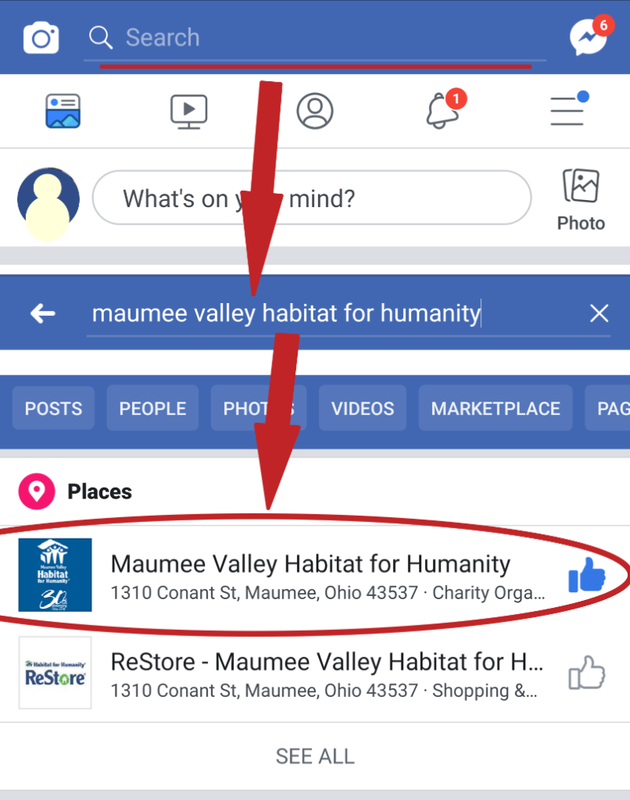 From your Facebook app, click on the search bar and type "Maumee Valley Habitat for Humanity." Select our Facebook page, which should be the first option. Step 2: Navigate to the "Raise Money" Buttons on your desktop/laptop or mobile device. Click on "Raise Money for a Nonprofit Organization," once you do this, a pop-up will appear. Click on "Get Started" and you'll be on your way to creating your fundraiser. From our home page, select the "Fundraiser" tab on the Menu Bar. Click on the "Raise Money" button. Step 3: Customize your Fundraiser with personal stories, photos, goal amount, and more. Type in "Maumee Valley Habitat for Humanity" and find us as the top selection. Once you've selected us, adjust your goal to how much you'd like to raise in your fundraiser and when you wish for your fundraiser to end. 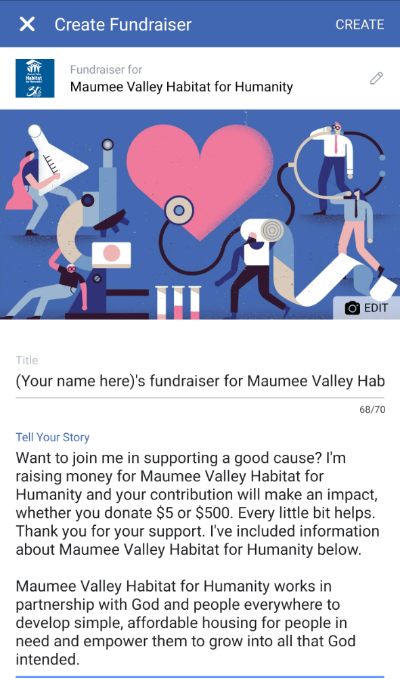 From this pop-up, you can change the title of your fundraiser and tell your story to your friends and family. Once here, you can edit your fundraiser title, story, and fundraiser photo. 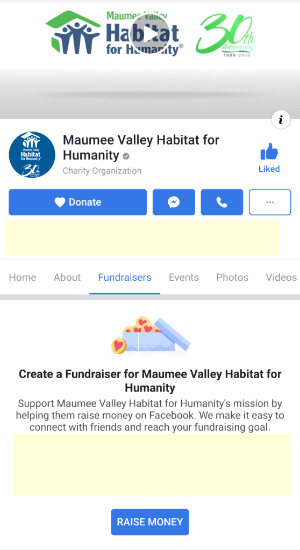 You can choose your own photo or from a selection of pictures from the Maumee Valley Habitat for Humanity page. We'll provide you a few suggestions to further tell your story through imagery. Step 5: Share with your friends! Now that you have your fundraiser page set up, share it with your friends! Spread the word and share how you’re making an impact in your community. Your support will transform lives and we think that’s information worth sharing!